The Rewind Button is a blogger challenge. We must listen to the Top 40 albums of all time as chosen by Rolling Stone and post our reviews every Thursday. Week 3: The Beatles Revolver. My boyfriend thinks I’m going about this project completely wrong. “You’re listening to these albums on your laptop speakers,” he says. “But snarkiness is my thing, and I’m not a real music reviewer,” I told him, “Plus, I don’t own a decent sound system.” Then he gave me that look. You know, the squinty eye gaze that tells me he’s holding back what he really thinks. I’ll admit this to you: he has a point. When I was young and music was important, I would lock myself in my bedroom and devour entire albums in one sitting. I’d open the jewel case and carefully slide out the booklet. Laying on my stomach, propped up by my elbows in a grunge rock sphinx pose, I’d listen and read the lyrics wanting to understand every element of the music. Today I listened to Revolver while tidying my apartment. Times have changed. My music appreciation has been cornered into my weekly Dance Dance Party Party classes where I look for upbeat, bouncy tunes that I, and ladies of all ages, can groove to. I appreciate music with my body, not my ears. The lyrics? If I’m not distracted by shaking my booty or like today, giving my clothing a smell-test before I hang it back up in my closes, I might catch a phrase or two. With my boyfriend’s judgement hovering over me, I tried to pay attention to Revolver with 10% more awareness than I’ve given past albums on this challenge. Thankfully this album clocks in at 35 minutes, so my 2012 short attention span could just barely handle it. I liked Revolver. I liked it more than the other two albums the Rewind Button has previously covered. It was fun, accessible, and there weren’t any annoying falsetto harmonies. It brought me back to my grunge rock days when I had a friend who was OBSESSED with the Beatles; she had her entire bedroom wallpapered in photos, album covers and Beatlemainia paraphernalia. 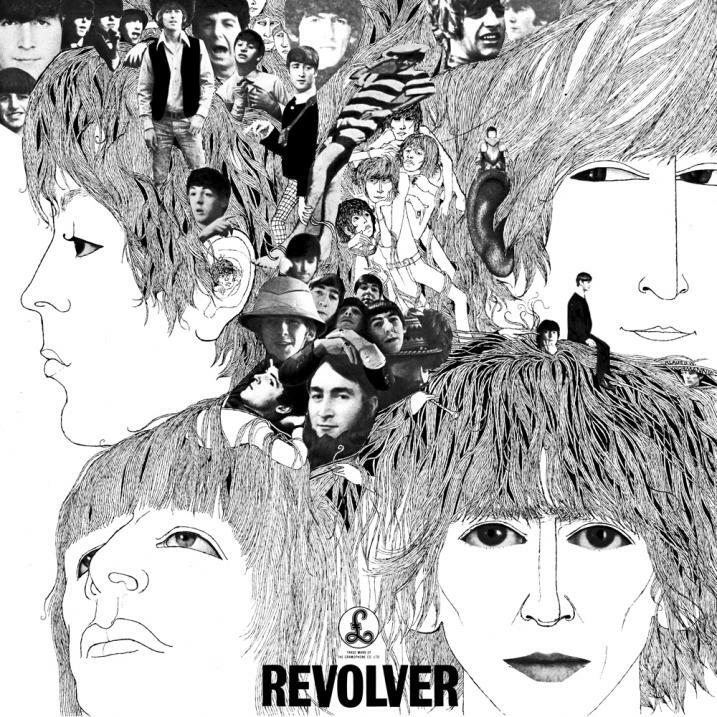 Revolver is an album I’d gladly listen to again. Perhaps while doing my dishes or reading the Sunday paper. * The songs are so short. This was so refreshing. Why does every song today have to be 4 minutes long ? Perhaps artists of the UK understand that a piece will be as long as it needs to be, like how the original Office TV show was only 12 episodes long (plus two Christmas specials). * Elenor Rigby. I forgot how much I enjoy this song. It made me a little verklempt. Does that happen to anyone else? * Good Day, Sunshine. My mother used to sing this in the morning. I forgot where it came from. I think I’ll start singing it in the morning too. It’s a better choice than ‘Good Morning’ from Babes in Arms. * Sitar!!!! I’m a huge fan of glockenspiels but sitar definitely is in my top 5 favorite instruments, along with clapping and triangles. Can you guess what the other instrument might be? 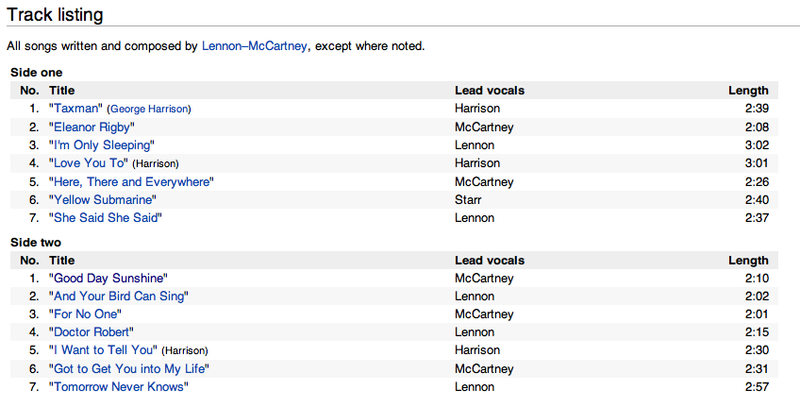 Wikipedia shows how short the songs are, and how everyone got a crack at singing lead on this album, even Ringo.